This article is about the form of physical exercise. For the Australian competitive performing art, see calisthenics (Australia). School children perform sit-ups, a common type of calisthenic, during a school fitness day. 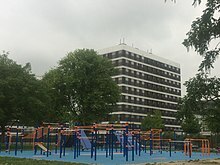 Urban calisthenics are a form of street workout; calisthenics groups perform exercise routines in urban areas. Individuals and groups train to perform advanced calisthenics skills such as muscle-ups, levers, and various freestyle moves such as spins and flips. Sports teams and military units often perform leader-directed group calisthenics as a form of synchronized physical training (often including a customized "call and response" routine) to increase group cohesion and discipline. Calisthenics are also popular as a component of physical education in primary and secondary schools over much of the globe. In addition to general fitness, calisthenic exercises are often used as baseline physical evaluations for military organizations around the world. Two examples are the U.S. Army Physical Fitness Test and the U.S.M.C. Physical Fitness Test. The word calisthenics comes from the ancient Greek words kalos (κάλος), which means "beauty" or "beautiful" (to emphasize the aesthetic pleasure that derives from the perfection of the human body), and sthenos (σθένος), meaning "strength" (great mental strength, courage, strength and determination). It is the art of using one's bodyweight as resistance in order to develop physique. The practice was recorded in use in Ancient Greece, including the armies of Alexander the Great and the Spartans at the Battle of Thermopylae. Disciples of Friedrich Ludwig Jahn brought their version of gymnastics to the United States, while Catherine Beecher and Dio Lewis set up physical education programs for women in the 19th century. Organized systems of calisthenics in America took a back seat to competitive sports after the Battle of the Systems, when the states mandated physical education systems. The Royal Canadian Air Force's calisthenics program published in the 1960s helped to launch modern fitness culture. Calisthenics is associated with the rapidly growing international sport called street workout. Street workout consists of athletes performing calisthenics routines in timed sessions in front of a panel of judges. The World Street Workout & Calisthenics Federation (WSWCF) based in Riga, Latvia orchestrates the annual National Championships and hosts the World Championships for all the national champions to compete at one competition. The World Calisthenics Organization (WCO) based in Los Angeles, CA. promotes a series of competitions known globally as the Battle of the Bars. The WCO created the first ever set of rules for formal competitions, including weight classes, timed round system, original judging criteria and a 10-point must system - giving increasing number of athletes worldwide an opportunity to compete in these global competitions. One of the basic calisthenics routines. Performed by a combination routine of a pull-up followed by a dip. May be done on pullup bars or rings. A front lever is performed by performing a lat pulldown of the bar with straight arms until the body is parallel to the ground, with the front of the body facing upwards. May be done on rings or pull-up bar. 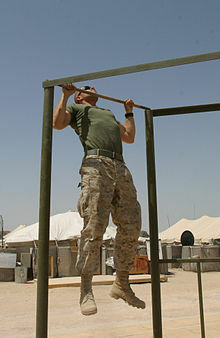 A US Marine performs a pull-up, a common calisthenic exercise. Performed face down on the floor, palms against floor under the shoulders, toes curled upwards against the floor. The arms are used to lift the body while maintaining a straight line from head to heel. The arms go from fully extended in the high position to nearly fully flexed in the low position, while avoiding resting on the floor. Chest, shoulders, and triceps are trained with this exercise. Much like the pull-up, except that the hand placement is reversed. The hands are facing the person as he pulls his body up using the chin-up bar. The chin-up focuses on the biceps muscles, rather than the Latissimus dorsi muscle which is the focus of the pull up. Standing with feet shoulder width apart, the subject squats down as far as possible, bringing the arms forward parallel to the floor. The subject then returns to standing position. Squats train the quadriceps, hamstrings, calves, and gluteal muscles. A back lever is performed by lowering from an inverted hang from rings or bar, until the gymnast's body is parallel to the ground and facing towards the floor. A handstand is the act of supporting the body in a stable, inverted vertical position by balancing on the hands. In a basic handstand the body is held straight with arms and legs fully extended, with hands spaced approximately shoulder-width apart. Performed in a prone position on the ground, the individual raises the legs, arms and upper body off the ground. Lying on the back, hands in fists under buttocks, move feet up and down. This is the name for holding the 'top' position of a push-up for extended periods of time. The primary muscle involved in this exercise is the rectus abdominis. This is running back and forth between two points (or cones) typically separated by 5-40 meters, as fast as possible, with a touchdown. The emphasis should be on stopping, turning back and accelerate back to a sprint as quickly as possible. A full body calisthenics workout that works abdominal muscles, chest, arms, legs, and some parts of the back. The L-sit is an acrobatic body position in which all body weight rests on the hands, with the torso held in a slightly forward-leaning orientation, with legs held horizontally so that each leg forms a nominal right-angle with the torso. The right-angle causes the body to have a notable "L" shape, hence the name "L-sit". The L sit requires you to keep your core tensed and hold your legs horizontal so your body sits in a perfect 'L' position. This requires significant abdominal strength and a high level of hamstring flexibility. Park in Osdorp, Amsterdam, NLD where one can practice calisthenics. An increasing number of outdoor fitness training areas and outdoor gyms are being built around the world. Some are designed especially for calisthenics training and most are free to use by the public. Calisthenics parks have equipment like pull-up bars, monkey bars, parallel bars and box jumps at one location. Freely accessible online maps exist that show the location and sample photos of calisthenics parks around the world. ^ "calisthenics (exercise) -- Britannica Online Encyclopedia". Retrieved 2010-08-04. ^ "Chin-Up Exercise Guide and Video". Bodybuilding.com. ^ "A complete list of Calisthenics exercises". www.calisthenics-101.co.uk. ^ "Calisthenics Parks - Spots Map". calisthenics-parks.com. Retrieved 2016-12-30.